"Hours" feels like a based on a true story film but in reality it isn't. Now this is both a good thing and a bad thing. Bad that the film contains numerous scenes that go beyond belief and knowing that the story is complete fiction adds to the feeling that elements of it wasn't well-thought off. On the one hand, the film is so effective in its thriller aspect that we can't help but hold on to our seats at times and go root for our unsung hero albeit the simple and predictable plot and outcome. Nolan (Paul Walker) finds himself in the thick of things when he just found out that his wife Abigail (Génesis Rodríguez) has died giving childbirth to their newborn baby girl. The baby itself is in a very fragile nature and needs to be put into a ventilator until she is able to breath on her own. As things couldn't get worse for Nolan, Hurricane Katrina has just hit his hometown New Orleans and finds himself in deep trouble as the power in the hospital goes out and flood waters prevent anyone from getting to them. Alone and desperate to save his daughter's life, Nolan must find a way to keep the ventilator's back-up battery charged every few minutes. "Hours" presents a simple and even predictable story and yet, it is also effective in transforming its simple plot into one with a heart. this does not mean that "Hours" is a great film but it is also not as bad as it could have been. In fact, the film starts off slowly and only ramps up in the second half. The biggest problem would be Paul Walker's acting. It was actually limiting the film as a major part of it would feature his character alone. 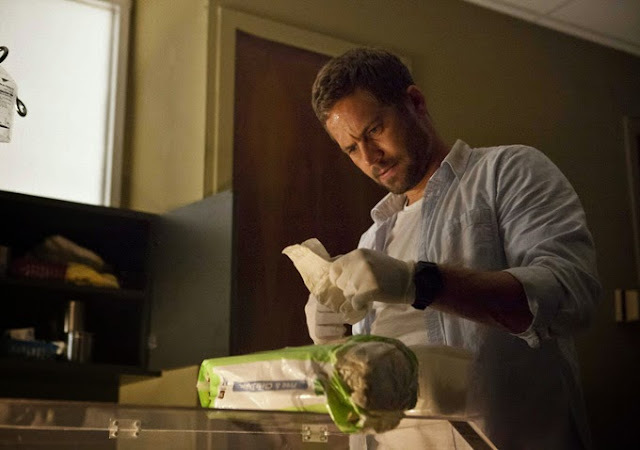 We could see Paul Walker gave his best but it wasn't enough at times and "Hours" felt less gripping in the first 45 minutes or so. Additionally, the film had a knack for presenting unbelievable situations specifically regarding the remaining time for the ventilator's backup battery against Paul's character accomplishing tasks all over the hospital. Worse, you could see his character take his time and not even have a panic or worry given he has 3 minutes or less to go to a floor or get medicine. Eventually though, "Hours" settles down and finds its mark in the second half. For some reason, the film saves itself and does a complete 180 degree turn. In the end, limiting as its lead actor's performance was and even against poorly-thought elements, "Hours" is still effective in bringing a message of inspiration, hope and accomplishment.